"Hold it, Tomoya Okazaki!" came a powerful scream and then a heavy dictionary zooming through the air, scattering all in its path. This is our first meeting with Kyou Fujibayashi. And when her piercing purple eyes demand answers, answers will be given. 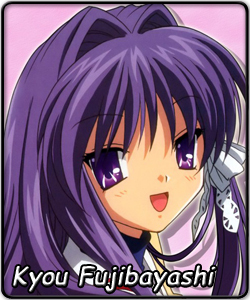 The caring typhoon of Clannad, Kyou knows no such thing as an “obstacle”. People have ears to listen to her orders, and legs to run away from her fury. Class representative, and one who faces great responsibilities with an even greater amount of force. At the end of the day, her friends really are thankful she’s on their side and willing to channel all that energy into helping them out. For those closest to her, Kyou opens up, showing another side to her personality. Keeping a pet baby boar, enjoying the guilty pleasure of driving a motor scooter to school, constantly keeping an eye out for her sister’s wellbeing... Kyou leads an exciting life, never slowing down. Even this girl has her own weaknesses, however. Her selfless actions give birth to an internal conflict. Help out loved ones, or follow her own desires? Getting between her friend and her crush would only delay the inevitable... but can she, Kyou Fujibayashi, ever just give up? Events to come test the strength of her heart. But no matter what the circumstances, for her friends, and for her own sake, Kyou has the power to stand tall.